On the River Avon, the principal town of Warwickshire has been dominated for more than 900 years by spectacular Warwick Castle. The origins of the town date back to a fortress built by the daughter of Alfred the Great in AD 915. Later, the powerful Earls of Warwick not only controlled the land surrounding their impenetrable fortress but also dabbled in English politics, most decisively as "kingmakers." In the late Middle Ages, this trading town, protected by the fort, became affluent. But after a 1694 fire destroyed most of its medieval buildings, the town carefully reconstructed the old buildings. Today, you can find many fun things to do, from strolling among the market stalls in Old Square and Jury Street to hunting through one of the town's many antiques shops. 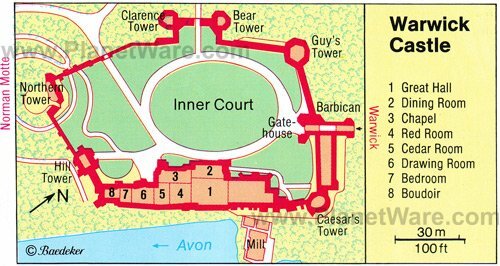 Warwick Castle is a massive battlement-crowned fortress reached via the former stable yard and adjoining moat. An extensive area of parkland boasts a number of gardens, among them a peacock reserve and rose garden. The inner courtyard is entered through the imposing Gatehouse (1350), and this is where visitors first notice the castle's walls and towers, ranging in height up to 131 feet. The fortifications date from the 16th century. The fort itself was renovated in the 17th and 18th centuries into a castle-like country seat, and its magnificent collection of furniture, porcelain, sculptures, and paintings also date from this period. Other visitor attractions include the impressive collection of weapons, unique interactive experiences, the 14th-century Castle Dungeon, a full-scale working siege machine (trebuchet), and a wax model museum designed by London's Madame Tussauds. A new addition just for kids is the fun Horrible Histories maze. Based on the bestselling history books, youngsters must find their way through the maze while facing such challenges as boarding a Viking vessel and surviving the trenches of WWI. Many of the streets in Warwick's old town still have attractive 17th- and 18th-century buildings that will appeal to tourists. These include the Court House with its Georgian ballroom, Landor House, and the lovely Shire Hall with its octagonal tower lantern. The West Gate has been retained from the old town walls, and guilds have assembled in the early-Gothic St. James' Chapel since 1383. An especially fun thing to do is visit the always-bustling Saturday Market. A Warwick tradition that has been held in Market Square for more than 500 years, the market is a great way to experience the historic town center as you sample delightful tasty treats or buy locally grown produce. Shoppers should also venture over to Swan and Smith Streets to explore the boutique shops, a particularly fun thing to do during one of the town's many excellent festivals (favorites include a popular folk festival as well as the enchanting Victorian Christmas Evening). In the very heart of the Old Town on Warwick High Street, the Lord Leycester Hospital consists of a series of magnificent half-timbered medieval buildings that date as far back as 1383. Named after a benevolent local aristocrat, the buildings became a charitable home for aging soldiers and their spouses in 1571. While still serving this purpose, much of the complex is open to visitors and is often used for various ceremonies, private functions, and even as a film set. This splendid complex also houses the Regimental Museum of The Queen's Own Hussars, a fascinating collection that provides a comprehensive history of the regiment from its foundation in the 17th century to the present time, including displays dealing with its role in the Battle of Waterloo. Hill Close Gardens is a delightful network of 16 fully-restored Victorian gardens, with high hedges between the quaint summerhouses, old fruit trees, and heritage flowerbeds. Notable as the only surviving gardens of this type in the UK, it's a remarkable opportunity to step back in time while enjoying what would once have been the pride of Victorian families who purchased plots of land outside the town center to indulge their passion for gardening. Plants and historic varieties of fruit and vegetables are available for sale, and the visitor center offers refreshments at the café plus exhibits about sustainable gardening practices. Built in 1443, the Collegiate Church of St. Mary was reconstructed after a 1694 fire with help from Christopher Wren. Its most splendid feature is the Beauchamp Tower on the south side of the choir. The tomb of the church's founder, Richard de Beauchamp, Earl of Warwick (1381-1439), is located in the middle of the chapel; his marble sarcophagus features 14-gilded copper mourners made by medieval sculptor John Massingham. The tomb of the Earl of Leicester, a favorite of Elizabeth I, is also here. The choir, completed in 1394, has finely-carved choir stalls (1449), a cedilla, an Easter Sepulcher, and the tomb of Thomas Beauchamp (d. 1369), while its ancient Norman crypt dates from 1123. Built in 1670, the Market Hall contains the Warwickshire Museum's extensive early history collections covering archaeology, social history, geology, and natural history. The museum's Jacobean home, St. John's House, boasts fascinating reconstructions of a Victorian kitchen and classroom (it once served as a school house), along with exhibits of period costumes, toys, dolls, and games. Also worth a visit here is the Royal Regiment of Fusiliers Museum (Royal Warwickshire). Highlights include displays focusing on the regiment's storied history, numerous weapons and artifacts, and an impressive collection of medals. Royal Leamington Spa lies only two miles east of Warwick and is famous for its wonderful medicinal springs and gardens. While here, tourists can take a stroll through the attractive glasshouses and flowerbeds at Jephson Garden or visit the splendid Royal Pump Room Gardens with its art gallery and café. One of the other popular things to do here is to simply wander the town's idyllic tree-lined avenues, with their Victorian and Georgian architecture, stopping to enjoy the numerous specialty shops and restaurants. Theatergoers are spoiled for choice, too, thanks to the rich program of regular productions on offer at the Royal Spa center and the Loft Theatre Company. Just four miles east of Stratford-upon-Avon and six miles south of Warwick, Charlecote Park is perhaps most famous for its connection to Shakespeare. Legend has it the Bard was supposed to have been caught poaching here, and after receiving a lashing as punishment went on to lampoon his captor in the somewhat laughable justice of the peace in Henry IV. Visiting this delightful (and very large) Tudor mansion today is a treat. Highlights include some of the best preserved Victorian-era décor and furnishings in England (the home was extensively refurbished during the 19th century), in particular the huge and ornately decorated library and the still operating Victorian kitchen. Also of note is the perfectly preserved laundry house from the same period, along with a tack room and a fine display of historic carriages. On the banks of the River Avon and butting up against the outer walls of Warwick Castle towering high above it, the delightful Mill Garden is a must-see for gardeners (as well as those who appreciate a great view). Although measuring just a half acre in size, this privately owned and extremely picturesque garden has become something of an icon, due as much to its incredible location as the hard work that went into its construction over a 60 year period that started in 1938. Spending some quiet time here will reward visitors not just with views of the castle walls, but also the ancient Old Castle Bridge (now ruins), as well as a number of swans who nest nearby. Although part of a busy roadway into Warwick, it's worthwhile making the short walk from the medieval town center to the "new" bridge across the River Avon. Here, you'll be rewarded with some of the most spectacular views of Warwick Castle and the river over which it looks (you'll be in good company as this is also a favorite spot for photographers). Afterwards, take a slight detour to Bridge End, a charming row of houses with half-timbered and stone buildings dating from the late Middle Ages.